A protest repressed, a journalist beaten, an artist detained, a newspaper censored, and an activist tortured. Sixteen months after what was hailed as a “landmark” constitutional referendum, and exactly one year after a new government was elected, like a broken record, headlines from Morocco continue to repeat themselves. 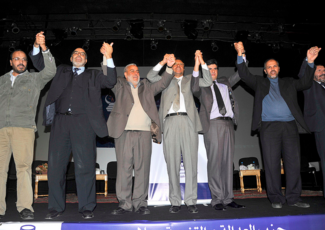 When the announcement for the 25 November 2011 parliamentary elections was made, the February 20 Movement and its supporters quickly agreed to boycott–a decision rooted in the prediction that the elections would bring about no real change. A year after the elections that gave the Party of Justice and Development (PJD) a majority win, the “path of reform” promised by the regime has yet to take off. Moreover, a combination of tax exemptions for the wealthy, food subsidies intended to prevent a popular uprising, and the disproportionate allocation of the state budget provide the outlines of an abysmal economic outlook for a country growing increasingly dependent on aid packages and International Monetary Fund loans. The November 2011 elections, which were initially scheduled for the following year, were seen by many observers as the first test to the constitutional reforms introduced by the king. Along with the reforms, a controversial quota was set in place intended to reserve a certain amount of seats for women and young adults. The elections were also the first that legally required the king to appoint the prime minister based on the party that received the most votes. The prime minister would also take on the title of “Head of Government,” giving him the power to dissolve parliament. However, even with the reforms, the vast majority of power remains within the hands of the king. These limited reforms that indicated a step towards liberalization, rather than democratization, as demanded by various parties, movements, and civil society members, failed to mobilize even half of the Moroccan population eligible to vote during elections. Turn out hovered at around forty-five percent, with the PJD winning about twenty-three percent of the vote, leading to the appointment of PJD leader, Abdelilah Benkirane, as prime minister. The November 2011 elections, like previous elections, yielded a coalition government, this time comprised of the PJD, the Istiqlal Party, the Popular Movement, and the Party of Progress and Socialism. Before Abdelilah Benkirane could even formally present his cabinet, the palace was pumping out press releases announcing a round of royal advisor appointments. Among them was Fouad Ali El Himma, a childhood friend of King Mohammed VI and a notorious palace crony who benefits both politically and financially from his relationship with the king. In the years leading up to the PJD win, Benkirane and El Himma were public rivals. During that time, Benkirane was quite vocal about his critical views towards figures such as El Himma. Yet less than two weeks into his term, Benkirane had this to say in reaction to Mohammed VI appointing El Himma as a royal adviser: “I am forming the new government in a country whose head of state is King Mohamed VI, he is my boss. It is not my business how the head of state, who is my boss, manages his royal court.” Beyond simply recognizing the authority that Mohammed VI has over him as Prime Minister, Benkirane unintentionally provided the skeptical voices within Morocco hard evidence that there is truly no indication that what the regime claims is a “path towards reform” is anything more than a stagnant wall built to preserve the status quo. The continued failure of the PJD and deafening silence of its most critical voices captures the multifaceted nature of power within the Moroccan regime. There is a cooptation of the PJD, as the monarchy simultaneously asserts its authority while appropriating the language of reform advocated by voices of the opposition. The PJD’s reputation as a party that skillfully placed itself within the political sphere, while maintaining a relatively critical stance regarding vague notions of corruption and nepotism associated with other popular parties, made it a compatible actor in the monarchy’s strategy. The election of the PJD was more of a political win for Mohammed VI than it was for the party. It was a convenient way for Mohammed VI to sustain the narrative of a “reforming Morocco”—a narrative crucial to the preservation of the monarchy. It is also the monarchy’s assertion of power that is damaging the PJD both in its image and its ability to effectively rule. In the most explicit way possible, Mohammed VI sent a message to the PJD and its leadership by not only appointing the party’s staunchest rival as a royal adviser, but prominent figures of the previous government as well. In an embarrassing display of Mohammed VI treading over the PJD, during US Secretary Clinton’s first official visit to Morocco after the November 2011 elections, her first public meeting was not with the foreign minister, but with Taib Fassi-Fihri who is the former foreign minister turned royal adviser. Though not all the blame should be placed on the monarchy. That the PJD leadership were previously such ardent critics demonstrates there is certainly an acknowledgment on their behalf of the power structures in place, making their failure that much more destructive to their political image. Some of its most prominent members, including the aforementioned Ramid, were sympathetic and at times, openly supportive of the voices of dissent, including the February 20th Movement. That sympathy and support quickly wore away within months after elections, and the systematic crackdown on the movement continued. More recently, in July 2012, a judge ruled that the movement itself was an illegal entity, and any association with the movement was therefore subject to prosecution. Even when presented with evidence of human rights violations and the questionable judicial process many members of the movement go through, any effort to rectify these rampant practices never go beyond a public acknowledgment. Even when the PJD attempts to establish itself as a legitimate political force, it avoids threatening the monarchy’s unchecked power. With Benkirane fully accepting the conditions under which him and his government can “rule”–conditions shaped by the power structures tilted in favor of the monarchy over an elected government–the PJD ventures into a realm where political parties are manipulated for the sake of preserving the monarchy. The PJD, like previous ruling parties, are useful to the monarchy as shock absorbers for political dissent. Meanwhile, the bickering ruling coalition of Islamists, socialists, and conservative nationalists allows the monarchy to maintain distance from critiques of political deadlock, and emerge as a “neutral” institution that “enforces change” for the “good” of the Moroccan people, as was the case for the constitutional referendum. But even the distance the monarchy enjoyed from direct opposition within civil society continues to lessen as economic conditions worsen. Just last week, members of the February 20th Movement and the Moroccan Association for Human Rights were beaten for protesting against the palace’s 895,000 USD daily budget. Pundits may continue to describe Morocco as an “exception,” but it was the combination of “exceptional” circumstances, including authoritarianism, repression of freedoms, and dire socioeconomic conditions that brought down neighboring regimes less than two years ago. Posted on November 25, 2012, in North Africa and tagged Morocco. Bookmark the permalink. Leave a comment.